Social media marketing is an important component to an integrated marketing campaign all year long. However, business owners and marketers should expect to use social media more often than usual during the holiday season. A recent study from Sprout Social suggests that consumers are significantly more likely to connect with brands through social media during the holiday season. There are a lot of ways that consumers may choose to utilize social media during the holidays. They will research information about gifts by consulting social media; they can contact the brand directly to ask about particular items; or they can post about the gifts they receive during the season. These uses aren’t just hypothetical. According to the data from the Spout Social report, this is already the situation for more than a third of consumers. The recent survey conducted by Sprout Social revealed that social media will influence holiday purchases for 1 in 3 Americans. Additionally, 30 percent of respondents said they’re likely to post about a gift they receive on social media. In a sense, the numbers cited above suggests that the uptick and social media won’t happen to every consumer, in fact, not even half of the people surveyed said they would be influenced or post about a gift they receive online. However, good business owners don’t ignore three out of ten possible consumers. So it makes sense to increase social media presence and engagement during the holidays. While consumers can post their own reviews and product photos, there is an increase in direct engagement with consumers via social media that businesses should be prepared for. 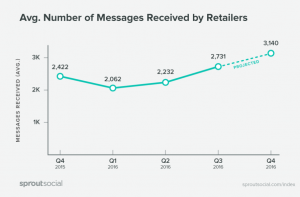 As social media grows as a means for customer service, business owners can expect an increase in messages with customer service issues and questions. 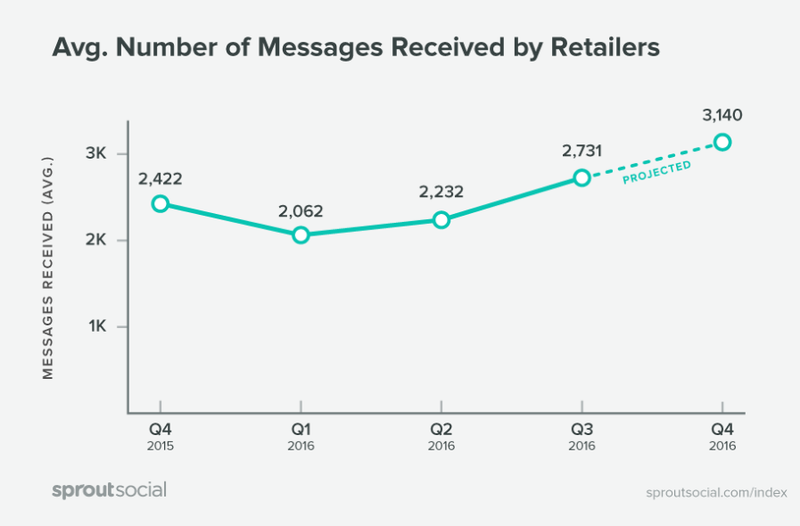 Sprout Social reveals that the average retailer can expect to receive more than 3,140 messages via social media during the 2016 holiday season. To put that in perspective, it represents a 30 percent increase over the same time last year. All of this means that now is the time to ensure your social media accounts are up-to-date and active. They should have recent content, and be prepared for increased social media activity involving the brand. This may mean moving customer service and PR reps closer to social media managers, or just connecting more closely with outsourced social media services to ensure that the company is giving consistent answers about products and policies over social media. Beefing up a brand’s social media presence and preparing for additional inquiries was also the advice of the Sprout Social report authors. With Thanksgiving a day away, the final gauntlet of the holiday shopping season is about to begin. It’s not too late for business owners and marketers to increase their social media marketing to get the maximum benefit from their multiple channels during the holiday season. For more recent information on holiday shopping data, read this article on how online stores are gaining ground in the war for Black Friday sales.